SESP junior John Wylie is honored at a Leadership Evanston event on Monday. The local program, which imbues participants with leadership and networking skills, recently celebrated its 25th anniversary. After 25 years of providing leadership classes for local residents and workers, community program Leadership Evanston honored some of the people who best characterized its ideals. 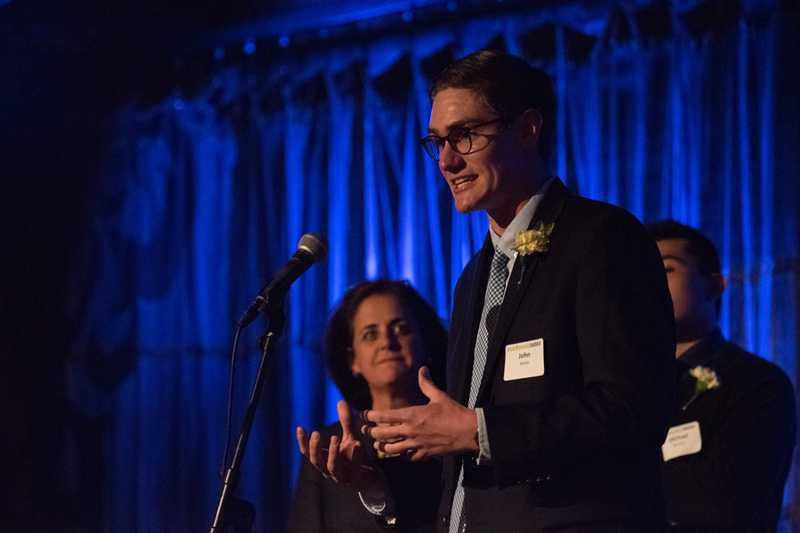 Among those recognized as emblematic of the program’s past, present and future was SESP junior John Wylie, who volunteers for Emerge — a related program — as a facilitator. The program gathers adults from the community in a “cohort” that meets once a month for 10 months in different spaces around the city, Leadership Evanston director Jennifer Moran said. Throughout the course, participants garner leadership skills, learn about the Evanston community and network with other participants, Moran said. “We figure out what are the important issues in our community, what are the challenges, what are the opportunities and then try to nurture that so that we all end up with a better and stronger community,” she said. Each meeting focuses on a different aspect of Evanston, like city government and the public school system. Moran said members of the cohort spend time talking with leaders in those fields and then present a group project on an idea of their own. Moran said the program has almost 700 alumni — including Ald. Mark Tendam (6th) and mayor-elect Steve Hagerty — and fosters relationships among participants. The Leadership Evanston program was designed in 1992 by its parent organization, Evanston Community Foundation, to educate people on leadership skills and networking, said Marybeth Schroeder, ECF’s vice president for programs. A year before the program launched, ECF surveyed the needs of the community and found that the same people remained in leadership positions, she said. “We weren’t growing a bigger, broader and probably more diverse leadership pool,” Schroeder said. The program set out to change that. Schroeder, who joined ECF in 1999, said anyone is welcome to apply to the program, but applicants must live or work in Evanston and commit to being involved in the city for five years — though that does not always happen. Schroeder said Leadership Evanston most recently updated its curriculum in 2009 to keep the program “alive.” She added that the program works to keep itself aware of what’s happening in the community and not remain stagnant. “While we’ve always talked about diversity, I think we’ve had an even larger emphasis on equity and what it means to be an equitable community,” Schroeder said. Wylie, who graduated from ETHS, said he was involved in the Emerge program throughout high school. Emerge works with students to teach leadership skills, group dynamics, advocacy and asset-based community development, Wylie said. Participating students work in groups throughout the academic year to apply what they learned to a community service program or to develop a new one, he said. “It’s an incredible program … and I think that there’s a lot of promise to Leadership Evanston based off of the success that we’re able to have with these young leaders in Evanston,” Wylie said. Looking forward, Moran said she hopes Leadership Evanston will have another successful 25 years. “It promotes so much conversation … and my hope would be that we can continue to do that work, continue to be active listeners and really raise up the stuff that we need to do to make Evanston continue to thrive,” Moran said.